A subculture that was once popular with China’s elite has been adopted by the lower classes. 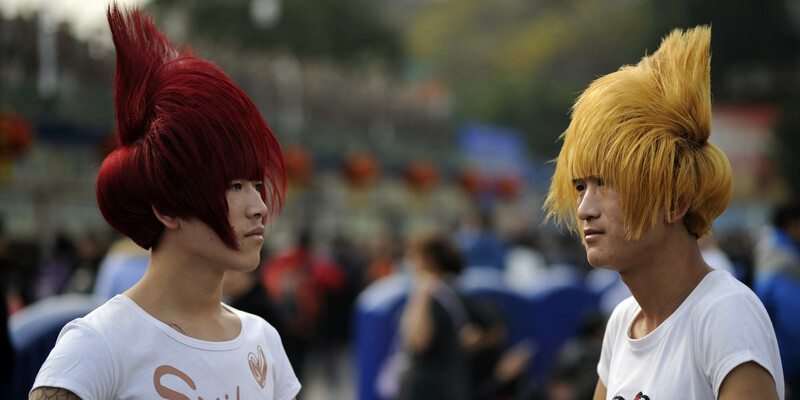 In China, shamate is a subculture characterized by glam rock outfits and elaborate hairstyles. Most of the participants of this culture are young, rebellious migrant workers who have come to Chinese metropolises from rural areas. Shamate is a transliteration of “smart,” which pokes fun at the rebellion of shamate enthusiasts against society — they neither care about academic achievement, nor about looking formal. The term in Chinese was coined by Mai Rox in Hong Kong in 1999, who began posting photos of herself online with eccentric hairstyles and dress. Her style was influenced by the visual and glam rock bands of the 1980s, cosplay culture from Japan, and Korean popular culture. Around 2000, shamate culture began spreading through mainland China’s entertainment industry after enjoying immense popularity in Korea, Japan, and Hong Kong. China’s first juvenile rock band “The Flowers,” founded in 1998, dressed in a shamate style. However, over the next decade this style would devolve from an urban fashion trend to an underclass subculture as it began to be picked up by young migrant workers, who were searching for their own unique identities and trying to carve out their own niches in their new cities. 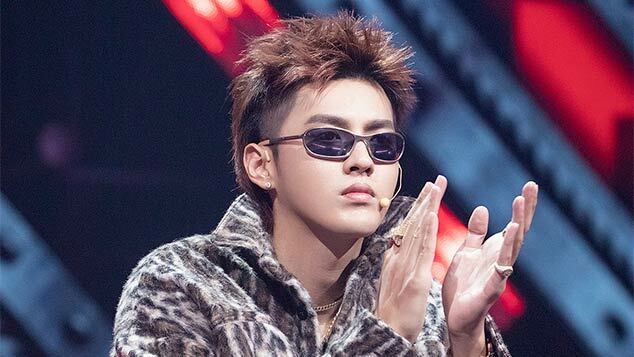 In April 2011, Wowkie Zhang, the original lead singer of “The Flowers,” posted a picture of a boy decked out in shamate garb on microblogging platform Weibo, mocking him for shedding his rustic roots and turning toward subculture. 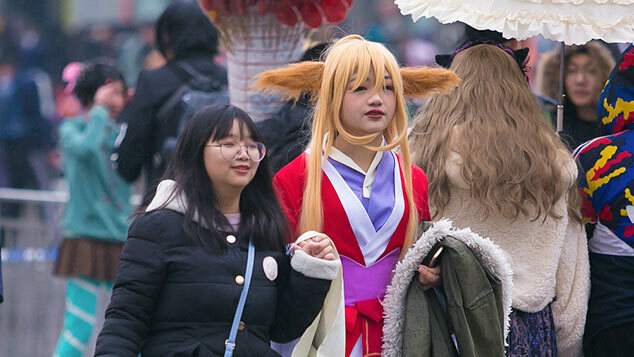 In April 2014, the encyclopedic video-website feidieshuo.com posted a video, “The Sorrow of Shamate Youth,” which explained how to spot a shamate enthusiast: they were born in a rural area in the 1990s, at most finished high school or vocational school, generally work in heavy industry in towns or suburbs of big cities, try to recreate urban fashion through cheap imitations, listen to mainstream music, spend a lot of time in internet bars, and use “Martian language” — a complicated online Chinese script — on the internet. The online ‘shamate’ communities expanded rapidly, and the once-urban fashionable subculture became overrun with members of the lower classes. The media chimed in as well. A widely circulated article posted in April 2013 by South Reviews, a subsidiary of the Guangzhou Daily News Group, concluded that the shamate youth “due to limited education, income, poor living conditions, and a dim future, lack the ability or awareness to improve themselves in culture and knowledge. They are representative of the incomplete urbanization and modernization of individuals and groups.” Consequently, shamate’s prestige as an urban fashion trend dropped and it became an underclass style. In “The Sorrow of Shamate Youth,” a voiceover asserts: “They are from the countryside, and make a living in the cities; they don’t have wealth or knowledge, the only thing they own is a Qzone elite title.” Qzone is a social networking platform popular with teenagers, and is in large part responsible for the popularization among the underclasses of shamate. The platform is much more popular among rural migrant workers than among populations who grew up in urban areas. According to data collected by a hacker in July 2015, that Qzone users are primarily located in the provinces of Guangdong, Hunan, Sichuan, Jiangsu, Henan — all provinces famous for heavy industry. In the big international cities, like Shanghai or Beijing, WeChat — another social messaging app — is much more popular. Qzone has a ranking system that divides its users into a hierarchy. To move up the pecking order, a user is required to be online for long periods of time, buy and spend Q Coins — equal to 1 yuan ($0.15), and update their Qzone profile daily. The higher the user rank, the more features are unlocked. It was on this platform where users fiercely compete to be unique that shamate, largely considered in the early 2000s to be a fashionable urban trend, took off. Special group pages for shamate enthusiasts began appearing, some including more than 10,000 members. Many of these groups had strict membership requirements. Qzone users were asked to proactively participate in group-related activities, spend large amounts of time online each day, and update their profiles with new shamate videos and photos. The founders of the groups often ran them like feudal lords, exerting absolute authority. The online shamate communities expanded rapidly, and the once-urban fashionable subculture became overrun with members of the lower classes. A strong sense of community was formed online, and strengthened through offline meet ups with other shamate enthusiasts. Consequently, shamate in China — which drew its influence from various foreign cultures — was transformed from a desired urban fashion-trend to a mocked subculture.